Men want to marry their moms. I’m sure you have heard that phrase before. However, the reasons why men want to marry their mothers and why women believe they do, differ greatly. Many women believe the reason is because men want to be babied and pampered their whole lives. For some men this is definitely true. There are a number of mamaboys, who will always be suckling at his mother’s breast no matter how old he is. These men are easy to spot, they are constantly calling their moms, always checking in and can’t make a single decision without consulting with her. These men are to be avoided like the plague, as you will never replace or even come close to being the number one women in his life. For all other men who have a regular normal relationship with their mom, they are not looking to be pampered or babied. The reason why they are looking for a woman like their mom to marry is because a man wants a woman like his mom to raise his children. You see, most men think they are a good person, and they believe their parents did a decent job raising them. Which is why they are a decent human being. Now as a man, a guy knows he will do the best job he can to raise his children. However, the woman he is with is an unknown factor. Therefore, to better ensure that his future children are taken care of, a man looks for similar characteristics between a woman he is with and his mom. There are lots of women these days who express zero motherly characteristics. If you love to party all night, drink like a fish, and constantly goofing off with your friends, don’t be surprised when he doesn’t recognize you as the mother type. I’m not saying you can’t have fun in life, but the reason he might not have proposed yet is because he can’t see the potential mother in you. It might be time to show him. What is the best way to do this? Get to know his mom, see what she is like and recognize the similarities between the both of you. Start expressing those similarities for him to see. Notice how I said similarities, you don’t need to change yourself. You just need to express similar characteristics, characteristics that you already have, but have not been overly evident up to this point. A prime example of this would be Kevin and his wife Stacey. Kevin and Stacey first met when Kevin was 30 and Stacey was 25. While neither one of them was really thinking of marriage, Kevin started growing tired of the fact that Stacey always wanted to party, drink and have a good time. She never really thought of anything else. She never took life to serious and didn’t ever think about life further then the next weekend. Wanting to become more serious Kevin felt this just wasn’t the type of woman he could do that with. They didn’t see each other for seven years, but when they finally met again Kevin realized Stacey had completely changed. She was done with all the partying and as Kevin described her “She had become the type of woman he would want to have a family with” After only six months of dating Kevin proposed marriage and they now have two beautiful healthy children together. While its true they were in different places in their lives when they first met, according to Kevin it was the fact that once he realized she would be a good mother he wanted to get married. 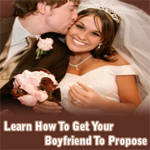 Discover more reasons as to why your boyfriend might be holding back his marriage proposal.